Almonds and pistachios are two kinds of nuts that can be highly beneficial to your health. They contain significant amounts of several nutrients, and eating them may also improve your heart health and cholesterol levels. However, because nuts are also high in calories, you should consume them in moderation to avoid gaining weight. A handful a day of almonds or pistachios can give you the nutritional benefits while keeping your waistline in check. Almonds contain magnesium, vitamin E and iron, and they have more calcium than any other nut. Both almonds and pistachios, like many other types of nuts, are good sources of protein. 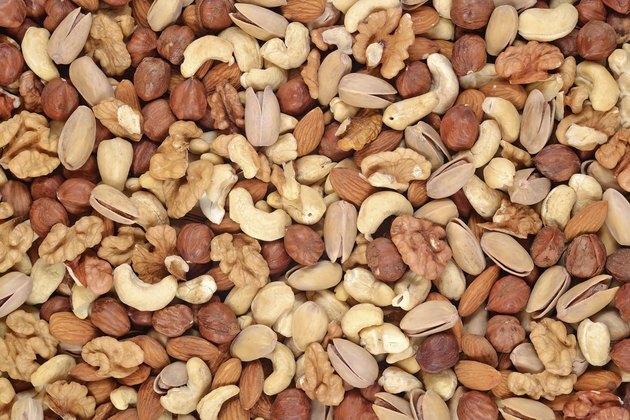 They also contain monounsaturated and polyunsaturated fats, which are the "good" kinds of fat, and swapping out saturated fats with nuts can improve your health. These nuts also provide fiber, which adds bulk to your diet and can help your digestive system function more effectively, as well as help you lose weight. Nuts like almonds and pistachios are an essential part of a heart-healthy diet. Eating them daily can cut your risk of getting the blood clots that may lead to a heart attack, as well as ensure that the lining of your arteries is healthy. Almonds and pistachios are rich in omega-3 fatty acids, which help regulate your heart rhythm, among other essential functions. They also contain l-arginine, which can improve the flexibility of your artery walls, making them less prone to developing clots. The monounsaturated and polyunsaturated fats in almonds and pistachios can help improve your high cholesterol levels. Making nuts a part of your heart-healthy diet will reduce the low-density lipoprotein, or "bad" cholesterol, levels in your blood. This can in turn help prevent heart disease as well, since high LDL levels are among the leading causes of the condition. Getting adequate amounts of fiber can also lower your cholesterol, and the plant sterols found in nuts may improve it as well. Keep in mind that even though the fat in nuts is the "good" kind, almonds and pistachios still contain high amounts of fat and calories. The Food and Drug Administration recommends eating a handful of nuts, or 1.5 oz., every day to improve your heart health. Eat pistachios and almonds that are raw and unsalted; consuming nuts covered in sugar or salt can cut their health benefits. You can also sprinkle your salad or cereal with chopped nuts to help you get that handful a day.